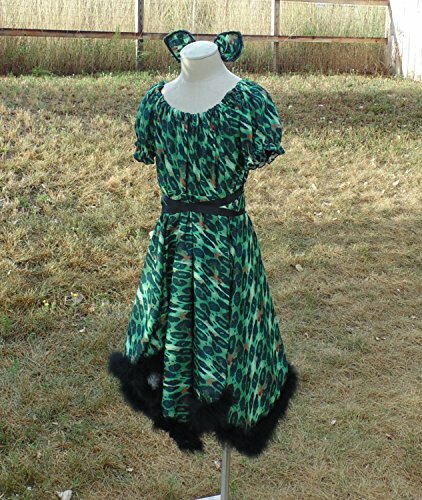 Cute Girls leopard is made with elastic at the neck and arms and ties around the waist for adjustment for sizes from 10-14. dress has a handkerchief hem and is about 30 inches long from top of shoulder to shortest part of the hem and 44 to the longest. This could be worn as a dress itself, or would look cute over white leggings or old jeans! I added some Crocheted belt loops on the sides to help keep the matching ribbon in place.Trimmed in super soft Marabou Fur, and i made the ears into little alligator clips, which is more comprofrontal than wearing a headband for hours. please let me know if there are any questions!